This is unabashedly a repeat of last year’s post (and the year before, et al ) … the same information holds true for 2012! Once again, we’re gearing up for the largest dog show in Colorado … The Rocky Mountain Cluster to be held February 17-20 at the National Western Complex (Expo Hall), 4655 Humboldt in Denver. The Premium List, which contains information on the show, parking, maps and entry, can be found here … Premium List. The actual times for judging and the ring numbers are not disseminated until just a week before the show; we’ll post a link to the judging program when available. If you’re thinking of attending, please be sure to give yourself plenty of time for parking, getting into the facility, and then finding the right ring and some chairs (rings are marked by numbers on tall poles). Parking, depending on where one finds an open lot, can run anywhere from $5 to $10 — and it may also be a very long walk! Entry fee to the Expo Hall is $5. Please note that dogs not entered in the show are not allowed on the site. If considering crowds/parking, Friday or Monday would probably be the better of the four days to attend. As the largest show in the region, the selection of vendors and their wares is pretty amazing … if it’s dog related, you’ll find it at this show! From art prints, to clothing, to grooming supplies, to dog beds, to canine-related jewelry, to crates and tables, it will be available. Might want to bring the plastic along (and keep in mind that the vendors start packing up on Monday for the return home). 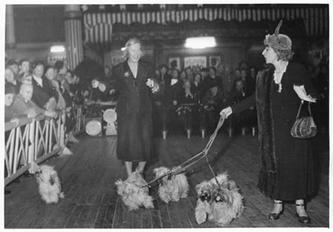 Besides the conformation competition, one can also find other venues such as Rally, Obedience, and Agility. These are generally held in the Events Center which fronts 47th Street; Rally is held on the 3rd floor of the main building. Hope to see you there … it’s a great reason to come out and support the breed! If you need more information, please feel free to contact me at: ApsoRescue@aol.com. Please note both the photo and the sentiment are under copyright and your respect of same is appreciated. Makes an awesome desktop photo! A little history: Taktsang Dzong or Paro Taktsang (spa phro stag tshang / spa gro stag tshang), also known as Taktsang Monastery or the The Tiger’s Nest, is a prominent Tibetan Buddhist monastery of the Nyingma (Red Hat Sect), located in the cliffside of the upper Paro valley, Bhutan. 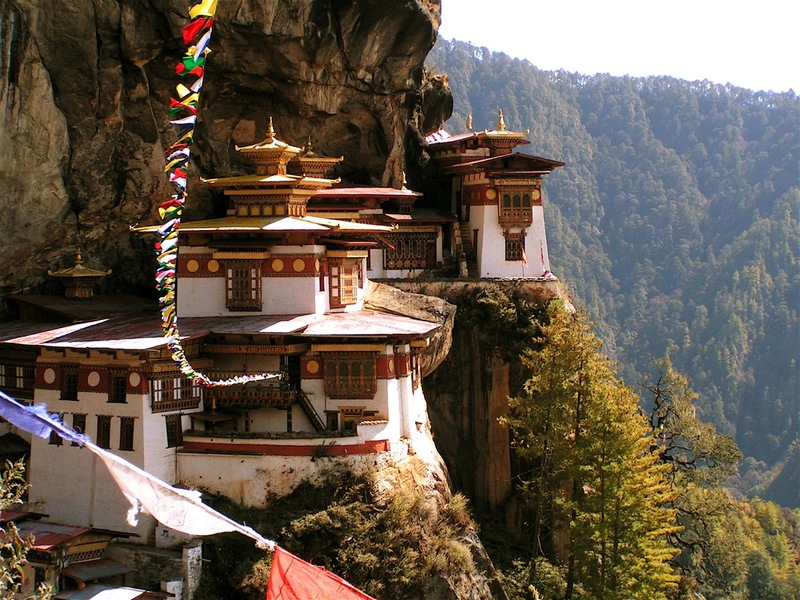 It was built in 1692, around the Taktsang Senge Samdup (stag tshang seng ge bsam grub) cave where Guru Padmasambhava is said to have meditated for three months in the 8th century. … has arrived in Colorado. Even though it’s not actually “winter” yet as December 21st is still a ways off. Nevertheless, winter is here. Our first snow dumped 14 inches on the flat and formed drooping cornices where the wind swirled off the back of the garage. One good snow and I’m ready for spring. I dread the short days that come with a return to Mountain Standard Time, preferring the long lazy days of summer. I’d much rather watch the flowers grow and the dogs play in the yard than heavy gray skies and blowing snow. The dogs don’t seem to share the same sentiment. First snow and they’re doing their best snowplow impression, kicking up heels as they run to and fro. Every now and again, a nose is dropped and the plow carves out a long furrow. 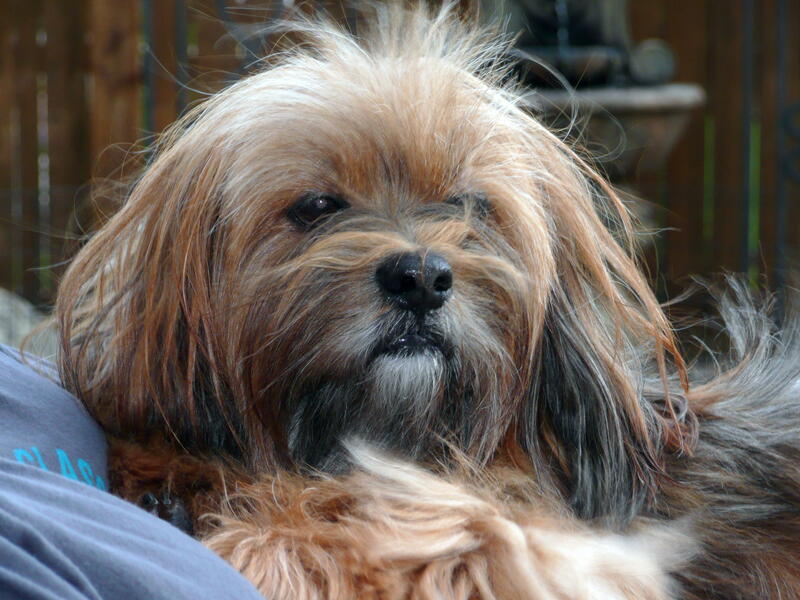 A face finally emerges, encrusted with snow crystals … a proper little mountain dog from Tibet! We added a bit of color to the winter landscape this year … a vertical Tibetan prayer flag. Lots of prayers going up that day! You’ll note we have double fencing — wooden privacy and a 24-inch high interior fence. The short fence was put up for several reasons: (1) to prevent the boys from fence fighting with the dogs to the east and south, (2) to confine all of them to the grass areas and out of the bark, (3) to keep Frankers from chasing squirrels and re-injuring his SI joint, and (4) to keep Dad’s partially-blind Tzu from getting lost in the vegetation behind the garage. Success on all accounts and it has definitely cut down on the barking outside. A good thing as barking dogs are not tolerated. It’s rude and neither I — nor the neighbors — want to hear it. Franker’s favorite part of winter is … when Mom drags out the fleece throw and curls up on the couch. He’s claimed the spot right behind my knees, settling in for a long evening nap. Standing beside the couch he waits until I’m settled and then hops up … never fails no matter what season it is. He eventually gets too warm and starts panting. At that point, I have to tell him to get down as he won’t leave on his own. That’s my boy. May you all have a warm fire and a dog at your feet for the winter. One of the birdhouses made by my father … after he retired he enjoyed putzing around in the yard and doing woodwork. His back fence was lined with houses for the little red finches. 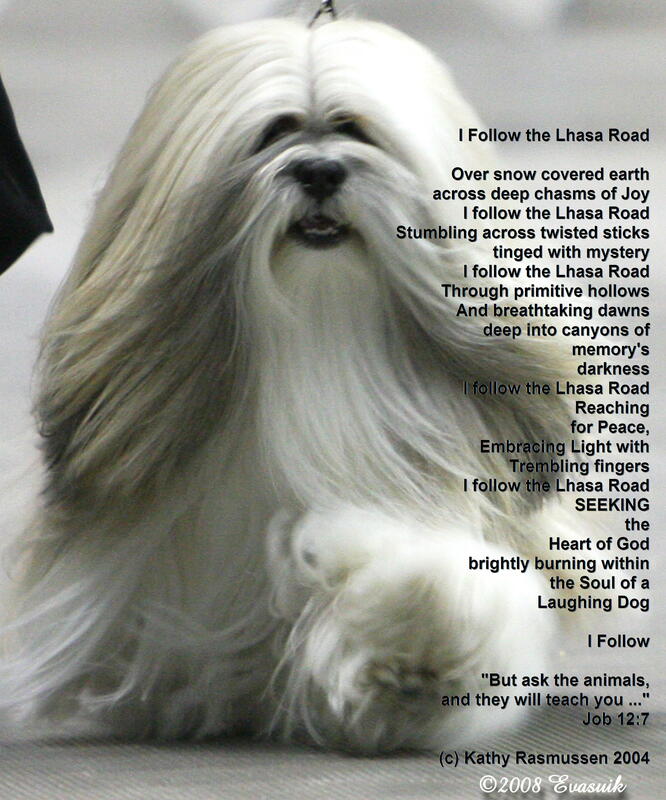 When’s the last time you heard a song about a Lhasa Apso? Probably … never. If that’s the case, then I have a rare treat for you. 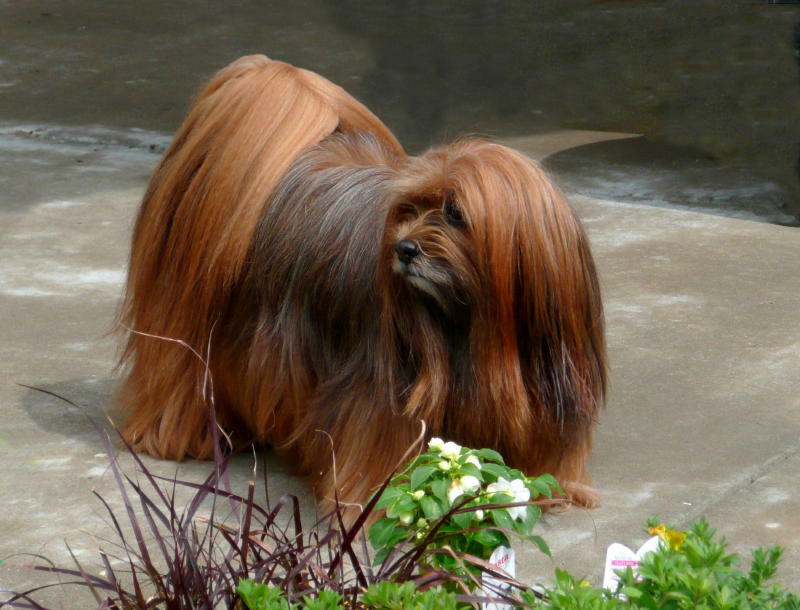 Canadian singer, Nancy Simmonds, has produced several CDs highlighting various breeds. She’s done an excellent job on her research of the breeds, their characteristics and then weaving them into song. This link shows all the different songs/breeds on each CD.